Just as it always does, summer is moving too fast. When did it become mid-July? Just yesterday it was the beginning of June and I was learning to flavor stocks and chop vegetables, and today I’m knee deep in organ meat. Organ. Meat. I’m talking about veal kidneys, sweetbreads (oh, they sound delicious, but don’t be fooled – sweetbreads have nothing to do with either sweets or bread; they are the thymus glands of veal, young beef, lamb or pork), calf’s liver, tripe (that’s the stomach lining of a cow, for those interested), and lamb’s tongue. The proper name for these tasty treats is offal, and it’s pronounced just like it sounds. And tastes. I know it’s sort of hip to enjoy eating offal, and I’ll admit that liver does have its merits (mainly in the form of my Gramma Inez’s chopped chicken liver – more on that another time), but what can I say? Ingesting animal entrails just isn’t really my thing. But, as Chef S. likes to say, “tough luck on you.” So, on Friday I put on a clean chef’s coat, suppressed my upchuck reflexes, and started the day by boiling and peeling lamb tongues. Les langues d’agneau. Sounds much better in french, n’est pas? It was nasty. The tongues were the worst. Any preparation that starts with: “eliminate the larynx and disgorge the tongue under cold running water” is bound to be sort of gross, but I’m not sure I can accurately describe the extent of the grossness. Suffice it to say, of all of the wretchedly gross things in the world, the act of peeling off the outer skin of a poached lamb’s tongue has got to be up there. And I mean up there. Yech. but if anyone brought them over to the Level 1 kitchen, I don’t know. I’m not trying to make any Level 1 vegans cry. So, like the first half of summer, offal day at school came and went, and I’m happy to say that I did try every dish we made on Friday: sautéed kidneys with mustard sauce, grilled and pan-fried sweetbreads (actually, the pan fried ones taste sort of like chicken nuggets… not bad for thymus glands), sautéed calf’s liver with caramelized onions, and lamb tongue with spicy sauce. I may have whimpered and gagged a little bit, but I did it, and it’s over. In the words of Chef S., “and blah blah bah, blah bah, and dat’s the end of dat stoh-ry. Now make me a clean-up, get reed of dis zoo.” Gladly. This week begins a seven-day stretch of pastry at school – everything from pâte brisée to sorbet to soufflé – and I couldn’t be happier. 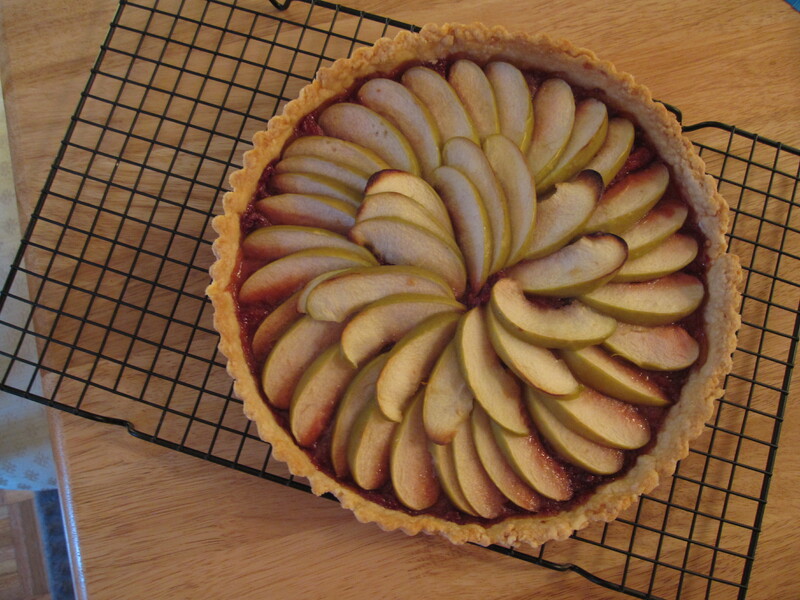 To celebrate this sweet turn of events, I thought you might like to make an apple tart with strawberry compote. I promise, there’s nothing awful about it. Meanwhile, make the compote. 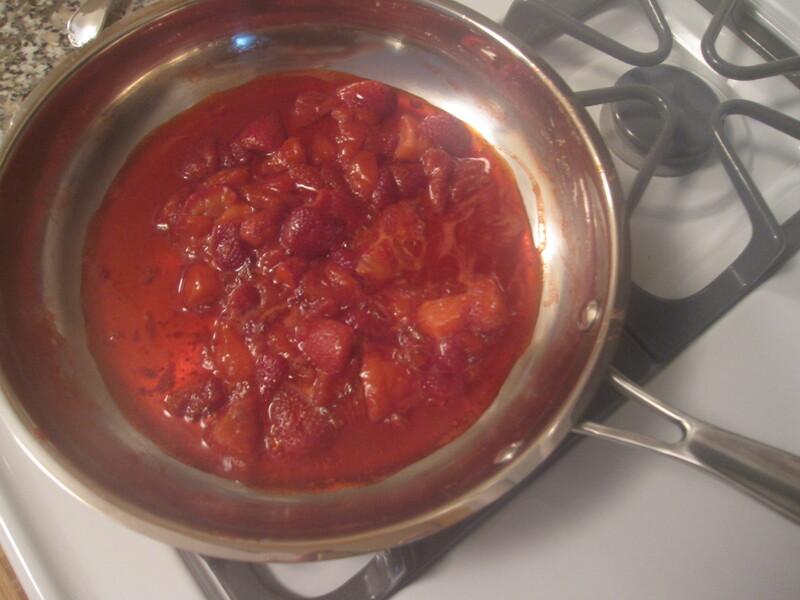 Put the strawberries, sugar, water, and lemon juice in a sauté pan over medium-low heat, and cook slowly under a parchment paper lid, until the strawberries are very soft and have exuded their juices. Preheat the oven to 425ºF. When the dough is thoroughly rested and chilled, roll it out on a floured surface and gently press it into an 8-inch tart pan. Spread the strawberry compote in an even layer on the bottom of the pastry shell. Cut the apples in half, and core them. (Some people like to peel them first – one step too many for me, but if you prefer peeled apples, by all means, go for it). Slice the apples in very thin slices horizontally, and arrange them decoratively on top of the strawberry compote, making sure to place the slices very close together (the apples will shrink in the oven, so be generous with the little slices). Pour the melted butter over the tart, and bake it in the 425º oven for 10 minutes. Lower the heat to 350ºF and bake for an additional 50-60 minutes. When it’s ready, the apples should be soft and brown on the edges, and the pastry should be golden brown. Serve warm with a scoop of vanilla ice cream, or room temperature with a dollop of cold whipped cream.